Featuring over 170 photographs, Cindy Sherman—only the fifth career survey by a woman in the Museum of Modern Art’s history—begins with the artist’s groundbreaking series of Untitled Film Stills (1977–80) and continues to her recent Society Portraits that address the unreality of aging in contemporary culture. Soaking up influences far beyond the art world, Sherman has created a body of work that has in turn inspired fashion, film, performance, and music. A film series, Carte Blanche: Cindy Sherman, runs from April 2 to 10 and features films personally selected by the artist from the museum’s collection. Rosemarie Trockel: Flagrant Delight is the first large-scale survey in Belgium of work by this German artist. Trockel often deals with the aesthetic legacies of Surrealism and Dada, and the WIELS show highlights her connection to the Belgian artists René Magritte and Marcel Broodthaers. Flagrant Delight features work produced since the early 1980s and debuts pieces created specifically for the exhibition. The cornerstone of the show is a new series of forty mixed-media collages that trace Trockel’s distinct sensibility through the juxtaposition of recognizable images and abstract motifs. Known for large-scale, filmed performances and multichannel videos, the Korean artist Kimsooja makes work that questions global culture and the role of the artist in the world. As the main actor in her videos, often filmed from behind, she engages in repetitive tasks that evoke ritual practice and Zen Buddhist philosophy. In A Needle Woman (1999–2001), comprising eight simultaneously projected videos, Kimsooja stands motionless in the middle of busy city streets—in Madrid, Tokyo, Beijing, Mumbai, Jerusalem, and more—as people walk around, ignore, or interact with her. R(ad)ical Love: Sister Mary Corita surveys the work of the nun, artist, social activist, and influential teacher, Sister Mary Corita (later known as Corita Kent). The exhibition features sixty-five prints created between 1963 and 1967, when Corita taught art at Immaculate Heart College in Los Angeles; the works combine the eye-catching graphics of pop with the sincere messages of protest signs and buttons that were synonymous with youth culture in the sixties. Highlighting her role as a political activist, R(ad)ical Love foregrounds the agitprop quality of the work and distances it from the commercial art that it may superficially resemble. Rachel Kneebone: Regarding Rodin pairs the porcelain sculptures of the British artist Rachel Kneebone with fifteen sculptures by the nineteenth-century master Auguste Rodin, chosen by Kneebone from the Brooklyn Museum’s collection. A highlight of the exhibition, Kneebone’s first major museum show in the United States, features The Descent (2008), her work inspired by Dante’s Inferno, presiding over nine large-scale pieces by Rodin. Juxtaposing the emphatic figures of Kneebone and Rodin highlights a shared interest in the “representation of mourning, ecstasy, death, and vitality in figurative sculpture,” while contrasting the differences of their processes and materials. 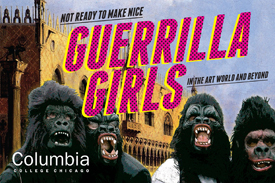 Postcard for Not Ready to Make Nice: Guerrilla Girls in the Artworld and Beyond. This two-part exhibition, devoted to the art world’s resident feminist activists, contextualizes the unruly group’s activism and art. The Glass Curtain Gallery features material related to the Guerrilla Girls’ work in museums and galleries, while the A+D Gallery stressess their political activities outside the art world and features a selection of films. Both presentations combine never-before-seen documentation and samples of fan and hate mail, as well as the opportunity for visitors to contribute their own voice through several interactive installations. This exhibition brings together recent work by the Helsinki-based artist Eija-Liisa Ahtila such as Horizontal (2011), The Annunciation (2010), and Where is Where (2008), with an iconic video from the early 1990s, Me/We, Okay, Gray. Bridging film, video, and installation, the artist’s work is lushly cinematic and strangely subversive, touching on themes of biopolitics and posthumanism. The selection highlights Ahtila’s exploration of human perception, tragedy, and the play between inner and outer worlds. This solo exhibition of the Canadian-born, Berlin-based artist Angela Bulloch collects three separate bodies of work: large-scale wall paintings, pixel installations, and interactive drawing machines. Bulloch’s interdisciplinary and theatrical approach invites viewer participation, and some works can even be “programmed” anew each time they are shown. Bold graphics, vibrant color, and references to the strategies of twentieth-century avant-garde movements—Constructivism, Minimalism, and the Situationists’ use of détournement—call into question the “informational status” of a given artwork. In conjunction with the exhibition, Witte de With will host a book launch on April 3 for Source Book 10: Angela Bulloch, a monographic collection of critical essays and collaborations with other artists.